A parent-teacher conference is really important to evaluate the growth of the child. Direct communication between the teacher and parent help both parties to have a clearer idea of the strengths of the student and what are the areas where the child needs more attention -so that he can progress himself better. 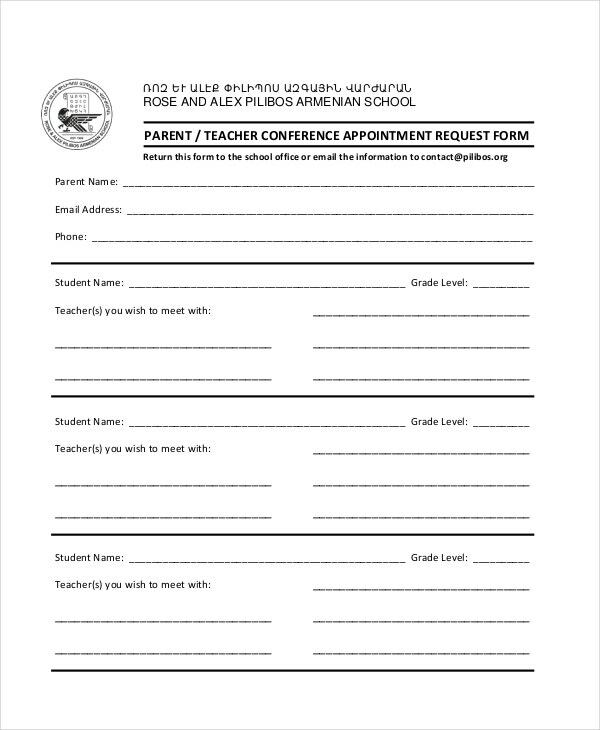 A parent teacher conference form is useful here in the sense that it helps the teacher to send out the conference notification and request to the parent officially and in a systematic way. 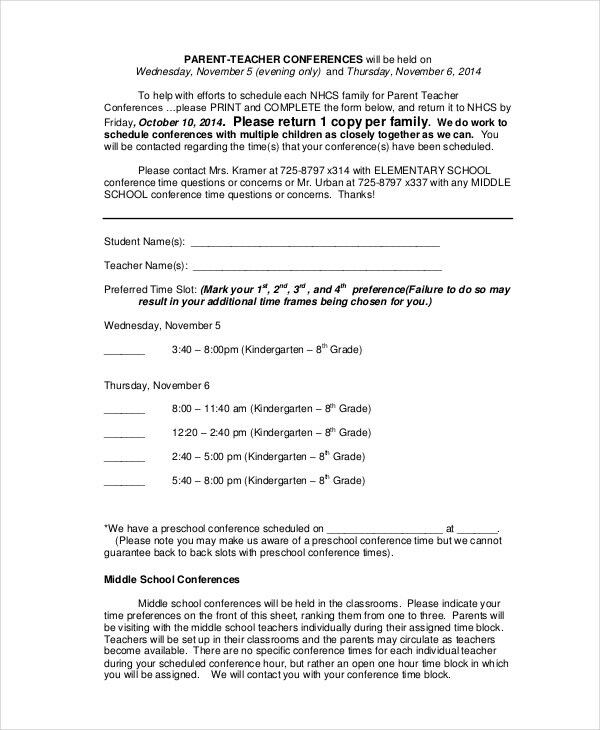 You have a handy parent teacher conference form here which clearly states the date and the timespan for the conference. Parents will have the ability to specify their preferred block of time for the appointment. You have an elaborate parent teacher conference form which will enable the school to gather information about who is going to attend the conference for the student and what would be the action plans for the student, teacher, and parent. You have a pragmatic parent teacher conference goal setting form here where the parent can write down about the strengths and weaknesses of their children so that the teacher and school can take needful steps accordingly. > What is included in a Parent Teacher Conference Form? A parent teacher conference form generally begins with the basic information of the student like his name and grade. Then, the form clearly specifies the date on which the conference is to be held. Some of the forms enable the parents to specify which time slot they are most compatible with for the conference and also which of teachers they wish to speak to about the child. 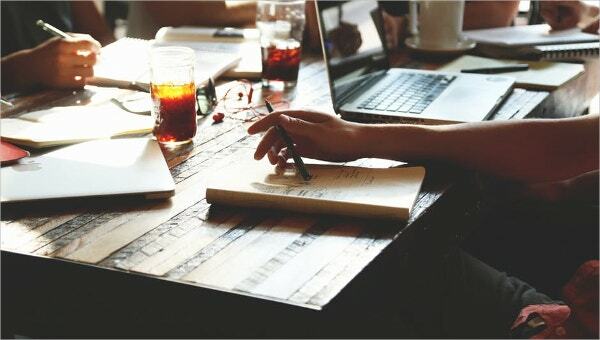 The best forms of such kind also provide room for the parents to state the points they are looking to discuss at the conference- like the student’s participation in the class, his weaknesses, the growth goal for the child and so on. 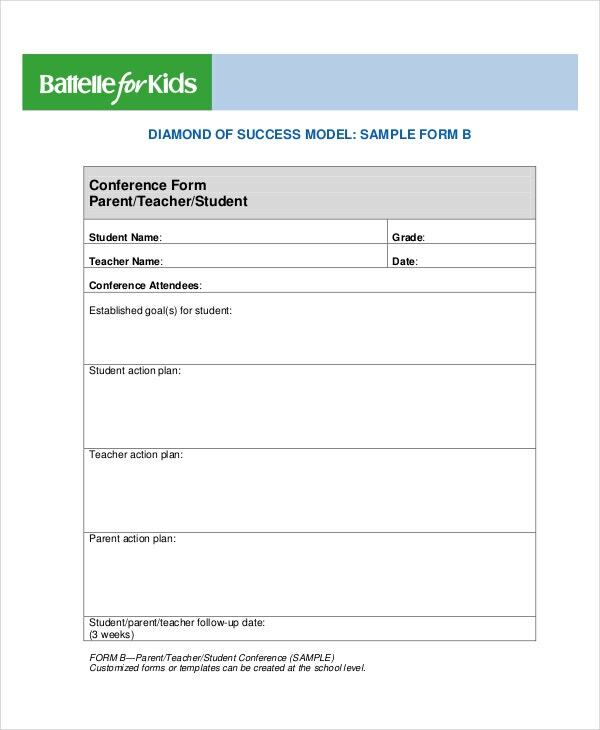 If you are looking for standard meeting templates for parent-teacher conferences, this template would be helpful. It will enable a parent to specify which teacher he or she wants to meet for the conference. 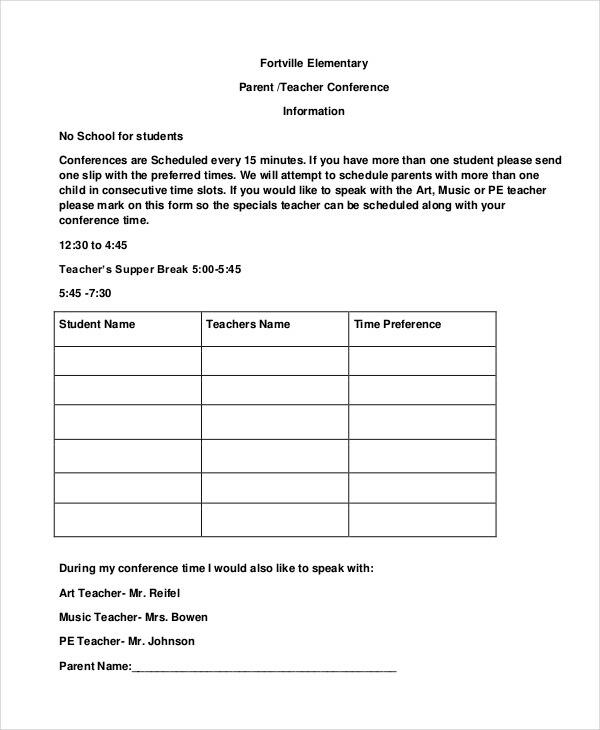 This parent teacher conference form will act as a reminder for the parents to attend the conference and it also enables them to specify which aspects of the child they wish to discuss. It contains room to state the growth goal that the parent has for the student. 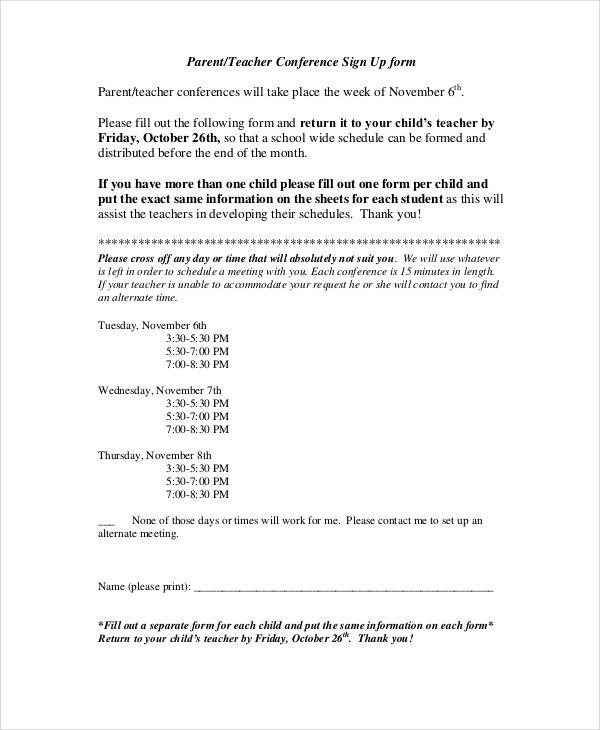 > What is the importance of the Parent Teacher Conference Form? 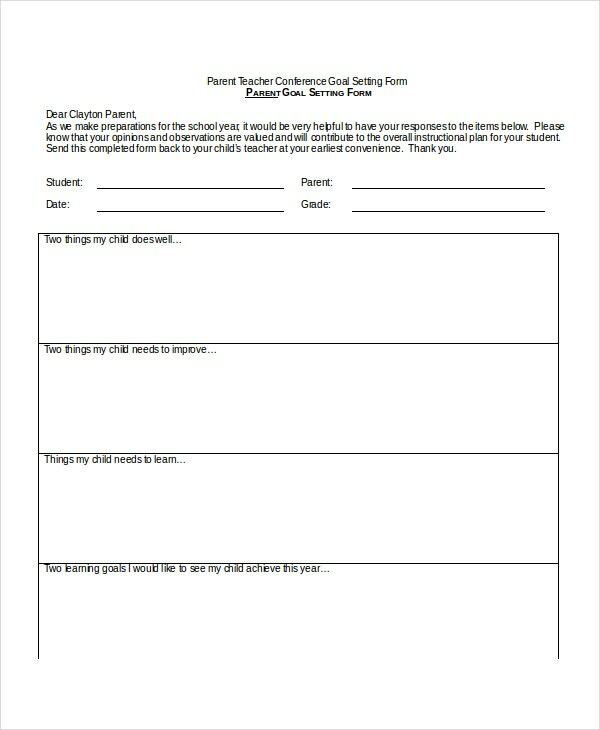 A parent teacher conference form is a handy aide when you are about to host a conference in your school with the parents of your students. With a clear mention of the date, the form would eliminate the risk of unmindfully forgetting about the important meeting on part of the parent. Moreover, some of these forms allow the parents to state the particular areas they are looking forward to discussing with the teacher regarding the child. This way, it helps the teacher to update herself beforehand about the activities of the students as well as their respective strong points and weaknesses. 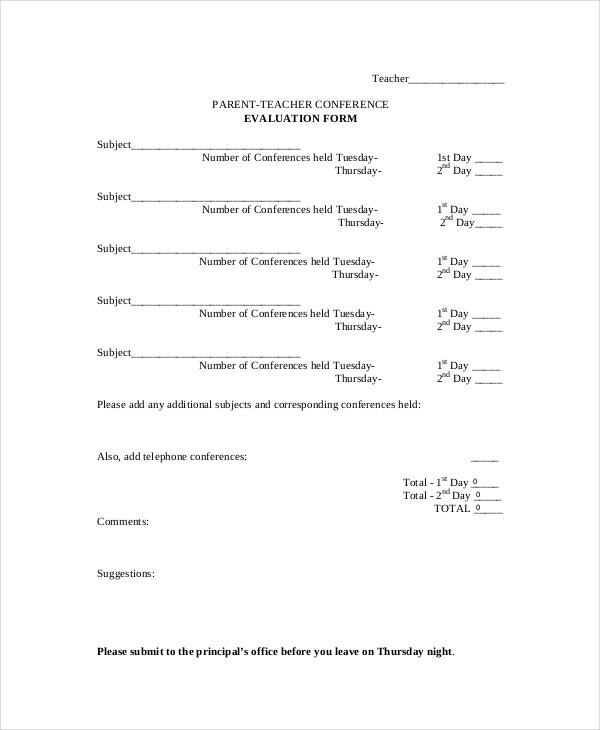 Do you need to create parent teacher conference forms and you are looking for ideas? 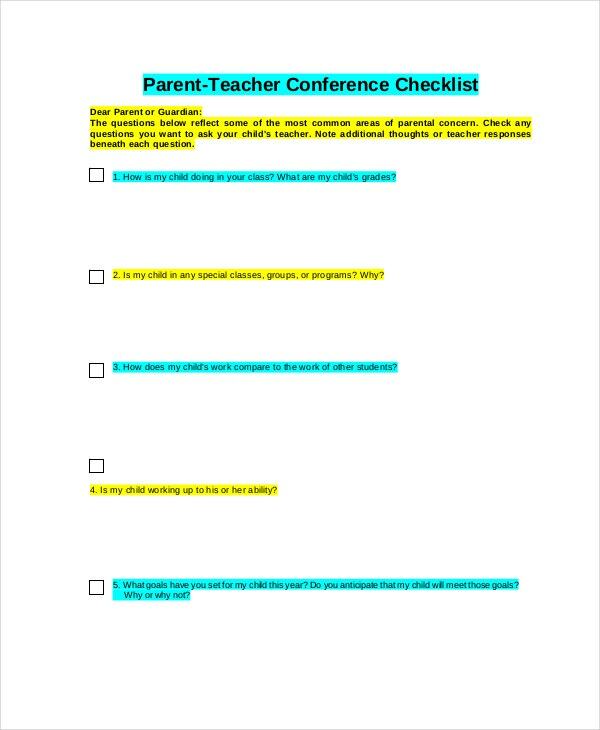 Well, not to worry anymore as the templates mentioned above have come up with a wide range of pre-structured parent teacher conference templates designed by experts. You would simply have to download a suitable one and modify it with your details.